Additional Info: Largest country in the world. Russia has the largest freshwater lake in the world, rivers and forests teeming with fish and wildlife, awe inspiring volcanoes, and towering mountains. 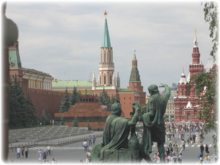 All foreign nationals are required to have entry visas to travel to the Russian Federation. Russian entry visas can be obtained at local Russian Embassy or Consulate, proper authorization (invitation) from the Passport and Visa Department (UVIR) of the Ministry of Internal Affairs or specially authorized travel agencies. » Red Square - The most famous city square in Moscow. The square separates the Kremlin, the former royal citadel and currently the official residence of the President of Russia, from a historic merchant quarter, known as Kitay-gorod (china-town). As major streets of Moscow radiate from here in all directions, being promoted to major highways outside the city, the Red Square is often considered the central square of Moscow and of all Russia. » Kremlin - A historic fortified complex at the very heart of Moscow, overlooking the Moskva River (to the south), Saint Basil's Cathedral (often mistaken as the Kremlin) and Red Square (to the east) and the Alexander Garden (to the west). 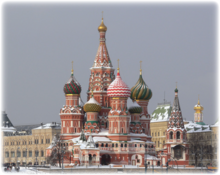 It is the best known of Kremlins (Russian citadels) and includes four palaces, four cathedrals, and the enclosing Kremlin Wall with Kremlin towers. The complex serves as the official residence of the President of Russia. » Arbat - The Old Arbat is a picturesque pedestrian street within the Garden Ring of Moscow. Nowadays, it is one of Moscow's most touristy streets, with lots of entertainment and souvenirs sold. The Old Arbat should be distinguished from the nearby New Arbat, constructed back in the 1960s as Kalinin Avenue and lined with Soviet skyscrapers made of steel, concrete, and glass. » Gorky Central Park of Culture and Rest is an amusement park named after Maxim Gorky. Gorky Park was opened in 1928 and is located at Krymsky Val. The park was created by the amalgamation of the extensive gardens of the old Golitsyn Hospital and the Neskuchny Palace and covers an area of 300 acres along the river. » The Peter and Paul Fortress - the original citadel of St. Petersburg was designed by Domenico Trezzini and founded in 1703. The fortress contains a number of buildings including the Peter and Paul Cathedral, where all Russian Tsars from Peter I to Alexander III are interred. Other structures inside the fortress include the still functioning Mint building, the Trubetskoy bastion and the City Museum. » Saint Isaac's Cathedral - the largest cathedral in the city and was the largest church in Russia when it was built. It was dedicated to Saint Isaac of Dalmatia, a patron saint of Peter the Great who had been born on the feast day of that saint. » The State Hermitage Museum - one of the largest museums in the world, with 3 million works of art (not all on display at once), and one of the oldest art galleries and museums of human history and culture in the world. The vast Hermitage collections are displayed in six buildings, the main one being the Winter Palace which used to be the official residence of the Russian Tsars. » Peterhof - A series of palaces and gardens, laid out on the orders of Peter the Great, and sometimes called the "Russian Versailles". It is southwest of St. Petersburg, overlooking the Gulf of Finland, an arm of the Baltic Sea. The palace-ensemble along with the city center is a UNESCO World Heritage Site. Mount Elbrus, a peak located in the western Caucasus mountains, in Kabardino-Balkaria and Karachay-Cherkessia near the border of Georgia, is a stratovolcano that has lain dormant for about 2,000 years. It is the highest mountain in the Caucasus which belongs to Europe. Mt. 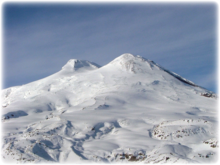 Elbrus (west summit) stands at 5,642m (18,510ft) and can be considered to be the highest mountain in Europe. The east summit is slightly lower: 5,621m (18,442ft). To get there: Take plane or train to Nalchik or Mineralniye Vody. Approximately 4 hour drive from Mineralniye Vody to Azau and about 2.5 hours from Nalchik to Azau. Azau is the highest village in the end of Baksan valley. There is a cable lift station to Elbrus in Azau village. To climb Elbrus officially you need: a Russian visa, a voucher with Elbrus region, OVIR registration (for being in a region more than a few days - if you are caught with no registration you will be fined), Elbrus area preserve permission (you can purchase this from an inspector at the time), and an Immigration card (when you enter Russia, you will receive this). Note - this range of mountains is on the border between Russia and Georgia - If you are going in the valleys near the border you may be stopped by border guard and asked about your border zone permit - worst case you could get arrested for this, at least a fine. Best season to visit and plan a climb is from July to August, although between from May to September is fine also.